Bonnie Parker and Clyde Barrow, two of the most notorious outlaws in 20th century American history, are real American folk legends, for better or for worse; they were so popular amongst the young and poor during a time of great economic crisis that they could attract the same amount of public attention as a Kardashian would today, despite them being cold-blooded killers at the end of the day who were known to shoot dead anyone and everyone that crossed their path, whether they be law enforcement officers or the poor saps they just happened to be robbing. Most of us know about their eventual downfall – the infamous final scene of Arthur Penn’s Bonnie and Clyde with Faye Dunaway and Warren Beatty is proof of that – but not much about the guys that were tasked with actually catching them. In previous incarnations, including Penn’s film, they were portrayed as either incompetent or purely one-note in their ruthlessness against Bonnie and Clyde’s crime spree, but those were all movies where the outlaws were the main focus; The Highwaymen is the first major film to be released that actually spotlights the people who took them down, with Bonnie and Clyde themselves literally faded into the background. Although, given how uneventful and largely dull this movie is, maybe there’s a reason why it’s taken so long for a movie to be made about these individuals. When the film begins in 1934, Bonnie and Clyde have been on their robbery and killing spree for a little while, enough for the press and the public to both cover and hail their exploits. Texas Governor Ma Ferguson (Kathy Bates) is understandably frustrated with their continued rampage, and is convinced to bring in former Texas Rangers Frank Hamer (Kevin Costner) and Maney Gault (Woody Harrelson) to help put an end to the couple’s crimes. Hamer and Gault, though, are old-timers who aren’t so acquainted with the newer technology that law enforcement now relies on – they are intrigued by the FBI’s then-new radio communications equipment – and prefer to do things the old fashioned way, by following the clues to their whereabouts and hoping that luck will swing their way. In theory, a film about the people on the other side of a real-life crime story like Bonnie and Clyde’s could be very interesting; it would allow the possibility to see their story from a whole new perspective, while also shining a light on the people who never received quite as heavy public attention as the very people they were trying to catch. However, the film lacks any real suspense, and contains very little in terms of genuinely revolutionary reveals about this story; it’s basically just a couple of old guys bumming around, waiting for the pieces to fall neatly into place, for the vast majority of the movie, and it doesn’t even have the courtesy of making these guys interesting or compelling enough to care about. The pairing of Costner and Harrelson, too, seems like a no-brainer on paper, but while they do just fine in their respective parts – though Harrelson is clearly having the most fun of the two – there isn’t much of a spark between them that is powerful enough to carry you through, which again comes back to the auto-pilot script that really doesn’t give them a whole lot to work with. Most of the time, you’re watching really dull things happening with these really dull characters, and because of that the movie achieves the opposite of what it set out to accomplish; I was left wanting to spend more time with Bonnie and Clyde, because as trigger-happy and cold-blooded as they were, at least they were actually interesting. It’s from a good director – John Lee Hancock, whose previous credits include The Blind Side, Saving Mr. Banks and The Founder – and has other notable talented people working on it, from composer Thomas Newman to co-stars Kathy Bates, Kim Dickens, John Carroll Lynch and Thomas Mann, but none of them can shake away its overall feel of a glorified TV movie. In that regard, it makes total sense why this is debuting on Netflix, because I can easily see this airing on something like Sky Atlantic or HBO as an original movie; it just has that television vibe to it, from its vast but un-cinematic scope to sometimes feeling like a period-piece procedural show, so watching it at home on your TV or laptop instead of a giant movie screen somehow feels exactly right for this particular film. In this scenario, you at least have the option of pausing it or moving on to something else if you’re not all that into it, which are things I can easily see most people doing because the movie really is such an unengaging drag that feels like a missed opportunity to properly dive into the people who took down two of the most notorious criminals in American history. It’s unfortunate, especially for those who knew or were related to the real Frank Hamer, as his screen depictions in stories about Bonnie and Clyde have been questionable at best; in fact, Hamer’s widow would go on to sue Warner Bros. for defamation of character following his portrayal as an incompetent lawman in Penn’s movie, eventually receiving an out-of-court settlement for her troubles. Until now, there appear to have been no lionising portrayals of the man, and when one finally does come around it only proceeds to make him look exactly like the dull and outdated authoritarian types that Bonnie and Clyde set out to stick it to. Again, you’d much rather be following their adventures, because at least you won’t be bored by them. 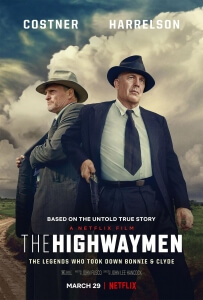 The Highwaymen tries but mostly fails to give an intriguing and engaging account of the lawmen who hunted down Bonnie and Clyde, wasting the opportunity on a mostly dull procedural that fails to make its central figures as interesting as the criminals they were brought in to take out.